Leonid G. Kazovsky, PhD, is a professor in the Department of Electrical Engineering at Stanford University. He is a Fellow of the Institute of Electrical and Electronics Engineers (IEEE) and a Fellow of the Optical Society of America (OSA). He is the founder and director of the Photonic and Networking Research Laboratory and is recognized for his outstanding research contributions to coherent optical communications and optical access networks. Ning Cheng, PhD, is a senior engineer at a major technology company as well as the author of more than sixty technical papers in electrical engineering. He served as a postdoctoral research fellow at Stanford University. Wei-Tao Shaw, PhD, is currently a member of the technical staff at Infinera Inc. During his time at Stanford University, he worked in the Photonics and Networking Research Lab where he focused on optical access networks and subsystems, and hybrid optical and wireless access networks. David Gutierrez, PhD, currently advises the Colombian Ministry of Information Technologies and Communications. While at Stanford University, his research focused on next-generation access networks. His work has been published in many scientific journals and conference proceedings. Shing-Wa Wong, PhD, graduated with a degree in electrical engineering from Stanford University. He has published more than twenty-five IEEE journal and conference publications and obtained three patents in next-generation broadband networks. 1 BROADBAND ACCESS TECHNOLOGIES: AN OVERVIEW. 1.5.4 Other Types of Optical Access Networks. 1.6 Broadband over Power Lines. 1.7.5 LMDS and MMDS Systems. 1.8 Broadband Services and Emerging Technologies. 2 OPTICAL COMMUNICATIONS: COMPONENTS AND SYSTEMS. 2.1.6 Light-Wave Propagation in Optical Fibers. 2.6 System Design and Analysis. 2.7 Optical Transceiver Design for TDM PONs. 3 PASSIVE OPTICAL NETWORKS: ARCHITECTURES AND PROTOCOLS. 3.1.1 Network Dimensioning and Bandwidth. 3.1.4 PON Packet Format and Encapsulation. 3.1.5 Dynamic Bandwidth Allocation, Ranging, and Discovery. 3.1.6 Reliability and Security Concerns. 3.2 PON Standards History and Deployment. 3.3.2 BPON Protocol and Service. 3.3.3 BPON Transmission Convergence Layer. 3.3.4 BPON Dynamic Bandwidth Allocation. 3.3.5 Other ITU-T G.983.x Recommendations. 3.4.1 GPON Physical Medium–Dependent Layer. 3.4.2 GPON Transmission Convergence Layer. 3.4.3 Recent G.984 Series Standards, Revisions, and Amendments. 3.5.2 EPON Point-to-Multipoint MAC Control. 3.5.3 Open Implementations in EPON. 3.6 IEEE 802.av-2009 10GEPON Standard. 3.7 Next-Generation Optical Access System Development in the Standards. 3.7.1 FSAN NGA Road Map. 4 NEXT-GENERATION BROADBAND OPTICAL ACCESS NETWORKS. 4.1.3 Line Rate Enhancements Research. 4.2 WDM-PON Components and Network Architectures. 4.2.2 Tunable Lasers and Receivers. 4.2.3 Spectrum-Sliced Broadband Light Sources. 4.2.5 Centralized Light Sources with RSOAs. 4.3.1 TDM-PON to WDM-PON Evolution. 4.3.2 Hybrid Tree Topology Evolution. 4.3.3 Tree to Ring Topology Evolution. 4.4 WDM-PON Protocols and Scheduling Algorithms. 5 HYBRID OPTICAL WIRELESS ACCESS NETWORKS. 5.2 Hybrid Optical–Wireless Access Network Architecture. 5.2.1 Leveraging TDM-PON for Smooth Upgrade of Hierarchical Wireless Access Networks. 5.2.3 Reconfigurable Optical Backhaul Architecture. 5.3 Integrated Routing Algorithm for Hybrid Access Networks. 5.3.1 Simulation Results and Performance Analysis. 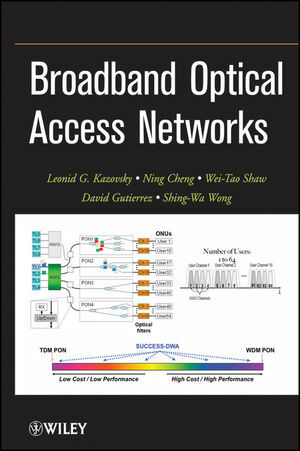 Comprehensive reference to all aspects of current and next generation broadband optical access networks. Presents the evolution of optical access networks including reach extension, bandwidth enhancement and service overlay. Discusses the convergence of optical and wireless technologies for broadband access. Numerous illustrations help clarify important segments of the book. Solutions manual will be available for course work.